Now, this is an interesting little book. If you just saw the cover — with two cute animals in Indiana Jones-style gear examining a map on the wall by light of a torch — you might think it would be aimed at the elementary school age of readers, but you would be wrong. 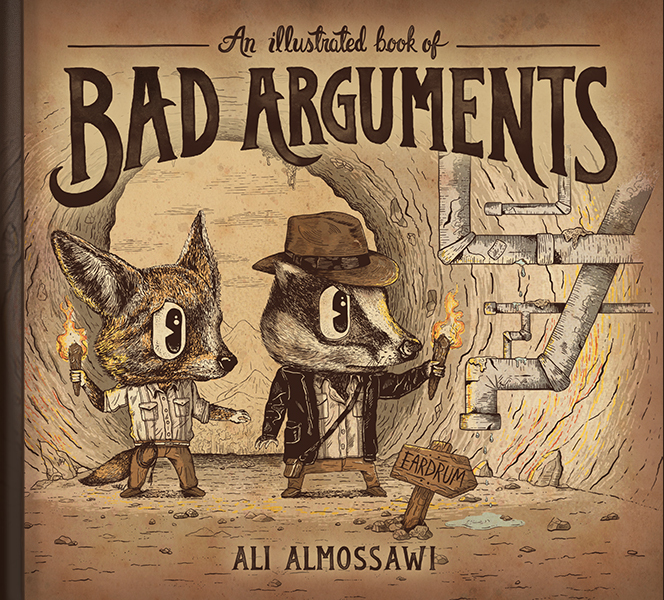 An Illustrated Book of Bad Arguments: Learn the Lost Art of Making Sense by Ali Almossawi (and illustrated by Alejandro Giraldo) is less a book led by graphics than a book supported by graphics, and it is packed with heavy philosophical thinking more attuned to high school or college. The illustrations support the text in a way that makes difficult ideas more accessible. The focus on this topic is an intriguing one, particularly in this day and age of “Argument” writing and reading and analysis with the Common Core shifts. This small “picture book” is really a book about “logical reasoning” that looks at common errors of argument, deconstructing fallacies of making arguments along a continuum of thinking: from circular reasoning to appeal to irrelevant authority to the slippery slope to affirming the consequent. Even though much of the content was new to me (some of of it reverberated with a high school class I only vaguely remember and some of it reminded me of a workshop given by a Western Massachusetts Writing Project teacher on the art of debate), I was drawn in by the ways Almossawi explains these fallacies, and how the illustrations tell a story of the fallacy or connect to literature allusions in a single frame. While I won’t likely be bringing much of this level of terminology into my classroom, I found the book gave me a more steady underpinning of the understanding of argument itself, and that knowledge should help with the teaching of argument to my sixth graders later this year. It helps that we are in the year of the presidential elections, where arguments will be no doubt abound as will use of many of the “logical fallacies” outlined in this book. I wonder how many Donald Trump has already broken? Genetic fallacy, anyone? This book sounds so interesting. Even though it is not appropriate for K-5 readers, it may be helpful to educators as they think about teaching opinion writing. Thanks for telling us about this resource. These illustrations are just funny to look at, reminds me of Tenniel’s Alice illustrations, especially the Red Queen. Antispam spitoon: dodo half My dodo half, you know, the part of me that is going extinct, keeps me honest by reminding me that eventually everythink I know will be consigned to the extinction heap.